And the award for Best Idea on the Internet this week goes to fellow DC blogger Lindsay of The Pursuit of Style. 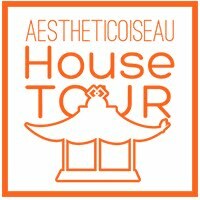 She dazzled us by bringing the Architecture bed from Room & Board to our attention in all of its colorful modern glory and then hinting at a pairing of said bed with Griffin & Wong Chinoiserie paper. 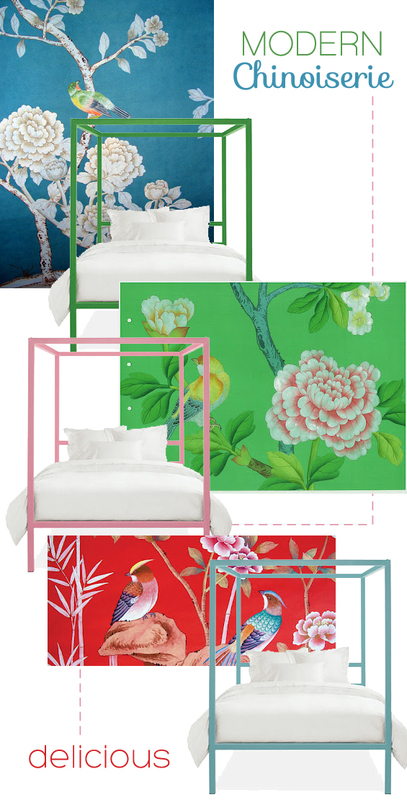 Chinoiserie lovers worldwide let out a collective gasp at the genius of this pairing and leave it to the queen of Chinoiserie, Beth of Chinoiserie Chic (also DC-based, I might add), to take that idea and run with it in one of the most visually satisfying blog posts I've ever read. Can you blame me for wanting to play too? So indulge me while I recycle what these two women have created in an effort to raise public awareness...just doing my part for humanity. Guess what? I didn't finish my sewing last weekend. You're shocked, I know. Apparently being almost 7 months pregnant makes you a little less limber to jump around measuring and cutting large pieces of fabric on the floor. So, I will charge ahead this weekend and hope to reach my goal of installing the nursery window treatments this weekend. Hope your own weekend is fantastic...see you Monday! I love the colorful bed frame idea ~ very creative!